Campion Marine Inc. of Kelowna, British Columbia, Canada's largest independent manufacturer of pleasure boats offers fifty-five models for 2012 in five series from 9 to 30 feet in length – Allante sport boats and cruisers; Explorer sport utilities; Svfara wake/surf towboats; Chase high-performance boats; and three models of Infinyte electric boats. Campion Marine has been building boats for thirty-seven years and markets in thirty countries around the globe. Campion Marine introduced four new Chase models at the Toronto International Boat Show in January this year bringing the total of Chase models to fifteen, in lengths up to 28-feet. The new models are the Chase 500 and 530 at 16'7" and 17'10" respectively and available in both outboard and sterndrive configurations – the sterndrive models designated with the letter "i"; the outboards with the letters "ob." Any discussion of Campion should begin with its construction philosophy and its commitment to environmental responsibility. Both of these concepts are embodied in the new Chase 530. Campion utilizes 3-dimensional woven fibreglass with Kevlar laminate reinforcement in the high impact area of the hull along the keel. In Campion's own words, "The most technologically advanced fiberglass mat available on the market today." The new Chase 530 also features Campion's Apex hull design and its F.I.S.T. Stringer System – Fiberglass Integrated Stringer Technology system which "allows for much larger bonding areas than a conventional stringer system and allows the bulkheads and floors to be bonded directly to the stringer system." Unlike many boats, the Chase 530 also utilizes composite transom construction replacing the treated plywood coring utilized by most manufacturers in the transom. On the environmental front, Campion is "proud to be the first boat manufacturer in the world to use Envirez®, a renewably sourced bio-derived resin from Ashland Performance Materials. Envirez resin is the first resin that uses a substantial amount of soybean oil and corn derived ethanol in its formulation." In addition, Campion has "switched to Ecomate environmentally friendly flotation foams and now use Acrastrip, an acetone replacement that is recognized in partnership with the Design for the Environment division of the U.S. EPA." This is all pretty impressive. The Chase 530ob is impressive in other ways too including its long list of amenities and features that are standard equipment often found as options on other brands. For example, hull graphics are created by gel coat right in the mold as opposed to vinyl applied to the outside. The bow filler cushion is standard equipment. 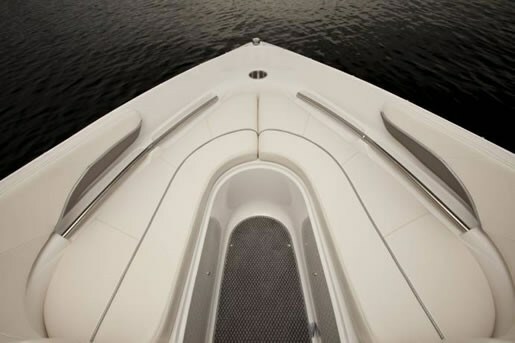 Two recessed bow safety rails run almost the full length on each side of the bow seating area. Cup holders are stainless steel – not plastic – and there are several of them located in strategic areas. 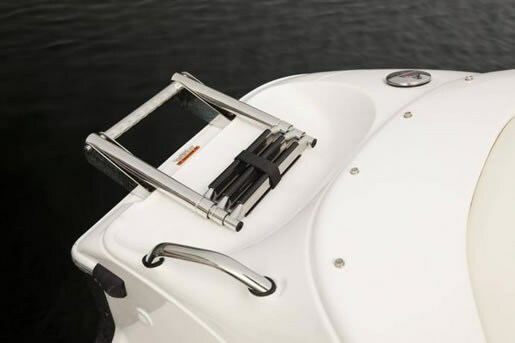 The hull rubrail inserts are of stainless steel as are the pull-out mooring cleats and the gas filler. 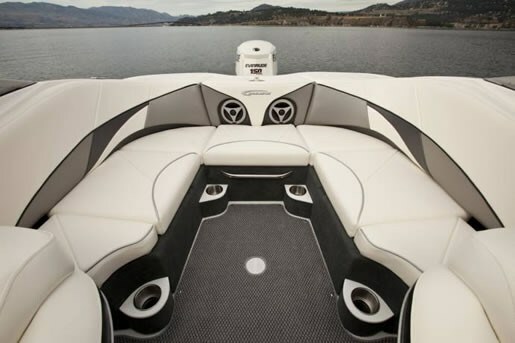 The cockpit of the Chase 530ob bowrider is molded fibreglass with optional snap-in carpet available. Two "Razor ultra suspension bucket seats", both with flip-up bolsters provide seating for the driver and companion while a U-shaped aft lounge with storage below occupies the balance of the cockpit and provides ample flexible seating arrangements. 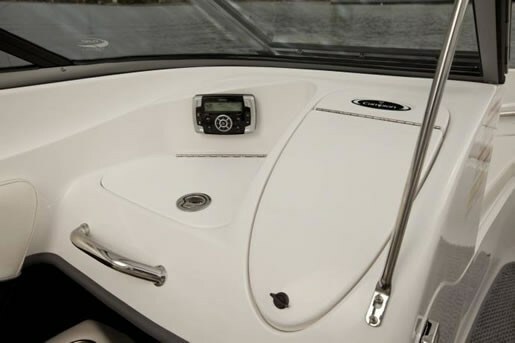 The very modernistic-looking dash provides standard outboard gauges with knockouts for additional gauges such as the optional depth sounder. The standard custom tilt steering wheel has a very sporty and high performance look and feel. The companion dash provides a glove box and built-in ice box. Standard entertainment is provided by a Clarion weatherproof AM/FM/satellite receiver with MP3 input and a USB port. Two Clarion speakers are standard. This can all be upgraded with CD, DVD, amplifier, subwoofer, more speakers, etc. 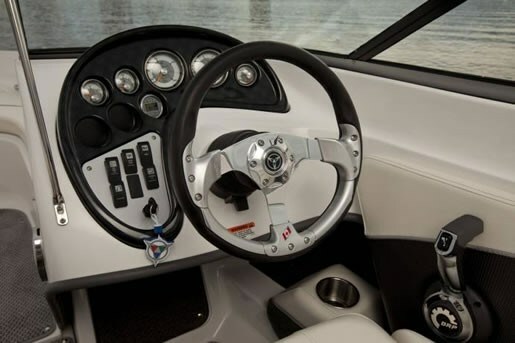 You may also want the optional flush mount LED docking lights, a stainless steel ski pole, and for more serious watersports enthusiasts, the Roswell wake tower with storage racks and with or without additional speakers. An in-floor ski locker can house most watersports, safety, and mooring gear and additional storage is provided under the gunnels along the sides of the cockpit. 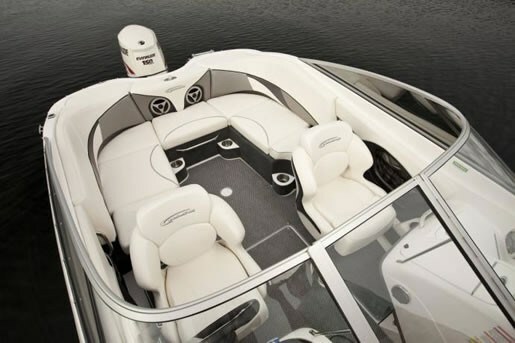 While a bow cover and cockpit cover are standard, more cruising-types will probably choose the Sunbrella convertible or bimini top with or without full enclosure and perhaps the cockpit filler cushions to create a huge lounging sunpad. They may also want to opt for the cockpit table as well. 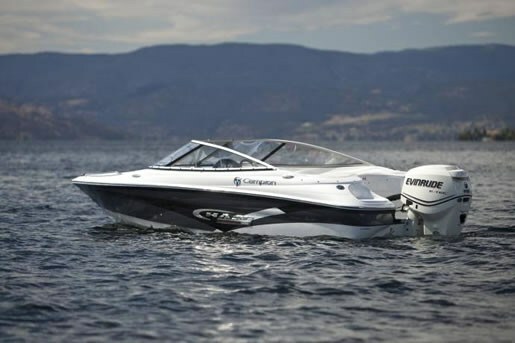 As an independent manufacturer, Campion offers factory pre-rig packages for Mercury, Yamaha, Suzuki, and Bombardier outboard motors along with full Faria gauge packages for each. Maximum allowable horsepower for the Chase 530ob is 150 and if you choose to go to that maximum rating, Campion recommends you also add the optional Seastar hydraulic steering. These new models from Campion really round out the Chase lineup and offer lots of boating flexibility with both outboard and sterndrive power.